"The sponsorship is very good and important to me"
I am very happy that I have the opportunity to be in the sponsorship. I suffered before but now I think I will not have such a problem again of not paying the school fees. Me and my parent are very happy because we are poor. I am going to study hard to pass my exams. The sponsorship is very good and important to me. It will help me continue my schooling up to the university. The sponsorship is very good for me. I am saying big thanks to you. Keep up the good work .It is welcome. 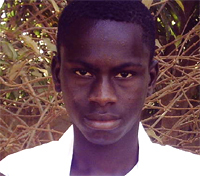 I am from Foday Kunda B.C.S to Nusrat Senior School in grade 10.